Orchot Chaim – Five books of the Torah, with Targum and the Rashi commentary, including the Or HaChaim commentary by Rabbenu Chaim ibn Attar – The Or HaChaim HaKadosh. Venice, . Two parts in one volume, of the first edition of the Or HaChaim commentary on the Torah. The title page reads: "…a new commentary on the five books of the Torah… was prepared and researched… by the scholar who is complete in wisdom, fear and humility, R. Chaim ibn Attar, a resident of the Maghreb, who went to set up his study hall in Jerusalem… innovative novellae which our predecessors did not envision…". The author begins his commentary with the statement: "The skies opened up and I perceived heavenly sights…". This book was accepted in the entire Jewish Diaspora and became a classic commentary in Chumash editions. This composition was especially sacred to the leaders of the Chassidic movement. 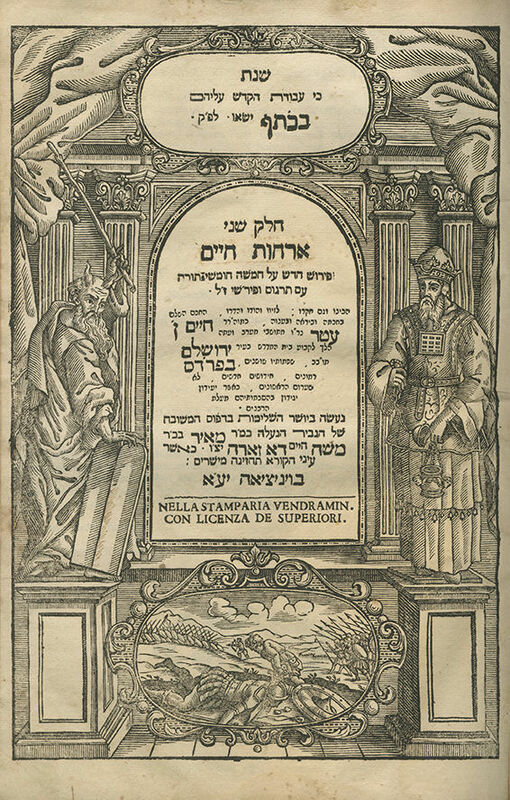 The book became instantly recognized, due to the Baal Shem Tov's praise of the preeminence of the author's soul, as the Chida, disciple of the Or HaChaim, relates in his book Shem HaGedolim: "The commentary on the Torah by the outstanding and holy R. Chaim ibn Attar, was printed in Venice in the Chumash edition with Targum and Rashi. And we heard that it is now held in high regard in Poland, and was printed there in another two editions. And this was due to the praise of the holy R. Yisrael Baal Shem Tov on the greatness of R. Chaim's soul" (Maarechet Sefarim, I, 54). Chassidic leaders describe the importance and holiness of the book in effusive terms. Rebbe Yisrael of Ruzhin stated that learning the Or HaChaim commentary purifies the soul. His son, Rebbe David Moshe of Chortkov (Chortkiv) related that after hearing this, he began learning the Or HaChaim commentary on the weekly portion consistently. R. Pinchas of Korets testified that he was the one who publicized the Or HaChaim, through an episode which occurred in Tcherin (Chyhyryn), when he exclaimed that he could see a great light in the city and he inquired whether anyone held a book of the Or HaChaim commentary in their possession. When the book was found, he asserted that it was what was illuminating the whole town. On a different occasion, his son took ill, and he undertook to learn a page a day of the Or HaChaim commentary (Imrei Pinchas HaShalem, I, p. 281). The Arvei Nachal, in one instance, before elucidating an ambiguous passage of the Or HaChaim commentary, described it as unfathomable without Divine Inspiration. The author, R. Chaim ibn Attar (1696-1743), known as the holy Or HaChaim, was a Torah scholar from Salé, Morocco, who spent the years 1739-1741 in Livorno, Italy, on his way to Eretz Israel. He completed his composition Or HaChaim while in Livorno (on Av 15, 1741), and sent it to Venice to be published. The book was printed in autumn 1741. In his biographic description of the Or HaChaim, his disciple the Chida wrote: "R. Chaim ibn Attar, a holy man from Salé, came to Jerusalem in the summer of 1742. And I merited to be a member of his elevated yeshiva, and my eyes saw the greatness of his Torah, he uprooted mountains, and his holiness was wondrous… he was like an ever-gushing fountain… and in Tammuz 1743 he was called up to Heaven at the age of 47. He authored Chefetz HaShem, Rishon LeTzion, Or HaChaim and Pri Toar, and his sagacity is discernable in his books, yet this is only a tenth of his wisdom… his sharpness was unbelievable, he exercised continuous separation from materialism …" (Shem HaGedolim, Maarechet Gedolim, 8, 42). Rebbe Yitzchak Isaac of Komarno, in his book Netiv Mitzvotecha, quotes the exalted terms the Baal Shem Tov used to describe the soul of the Or HaChaim, "…every night he heard Torah from G-d, most of his holiness is not possible to describe in words, and he descended from the Merkava…". R. Efraim Zalman Margolies, the Beit Efraim, also described him in superlative terms, as a heavenly being, father of all Torah bearers in the Western countries. On both title pages, the title was originally printed as "Orchot Chaim", and only in the author's preface and in the body of the book is the commentary named Or HaChaim. A censor inscription in Italian from 1875 appears on the verso of the title page. Inscriptions and glosses in Italian script (mostly consisting of references to the Haftarot at the end of the weekly portions). Two parts in one volume. , 86; 78; , 60; 72; 58; 8; 12 leaves. 32 cm. Good-fair condition. Stains. Dampstains. Worming to several leaves. Worming slightly affecting text to approximately four leaves (in upper-left corner). Minor tears and damage to first title page and other leaves, repaired. Tears to six leaves (Bamidbar, leaves 28-33) affecting text, professionally restored, with photocopied replacement. Fine leather binding.